Starring Samuel L Jackson, Bruce Willis, James McAvoy, Sarah Paulson, Spencer Treat Clark, Anya Taylor-Joy and Charlayne Woodard. 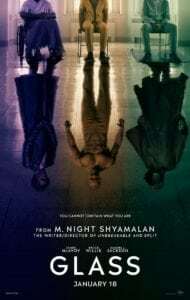 The worlds of Unbreakable and Split collide, as Mr Glass executes a devious and complex criminal masterplan involving David Dunn and the many personalities of Kevin Wendell Crumb. I feel vindicated. Ever since Bruce Willis grouched his way into the final scene of Split, ending a perfectly solid, trashy horror film on a sour note, I have been very concerned at the prospect of Glass. Nothing about either Unbreakable or Split suggested that these characters should exist in the same world, until M. Night Shyamalan produced his trademark narrative crowbar in order to engineer a plot twist and make it so. It turns out that my discomfort was entirely valid. Glass is bobbins of the highest order. Indeed, the first act is essentially a sequel to Split and it benefits enormously from that. James McAvoy continues to use the character of Kevin Wendell Crumb and his split personalities to have a terrific time, hopping between accents, physicality and emotions with consummate skill. The opening act, in which Willis’s David Dunn – now newly monikered as The Overseer – attempts to track Kevin down, is impressively tense and benefits from some enjoyable silliness, including Shyamalan’s inevitable cameo. The problems start when this thread comes to an end, with Kevin and David now incarcerated in the same mental health institution as Mr Glass (Samuel L Jackson) under the watchful eye of Sarah Paulson’s Dr Staple. She’s determined to convince the trio that they are suffering from a unique delusion of grandeur, when actually their apparently superhuman antics have a rational explanation. This would all be fine, were it not for the fact that there’s 45 minutes of movie here that essentially amounts to Paulson delivering a fairly dull TED Talk. It’s as if Shyamalan has fallen in love with his concept to the extent that he has forgotten he’s supposed to be making a thriller movie. Each of the three central characters is given a non-super counterpart – Elijah’s mother (Charlayne Woodard), David’s son (Spencer Treat Clark) and Kevin’s near-victim Casey (Anya Taylor-Joy) – and they are seemingly used for no reason other than to pad the narrative a little outside of the hospital. It’s only Taylor-Joy’s Casey who serves any narrative purpose, though her interesting understanding with Kevin and his identities is sorely underused and ultimately tossed aside in favour of spending more time with Jackson’s title character. And we need to talk about Mr Glass. 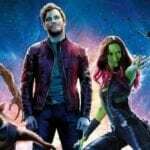 It’s his name that gives the film its title, and his villainous scheme that catapults the movie into its third act – which flirts with the kind of mega-spectacle beloved of superhero movies only to constantly pull things back for more talking. Jackson spends the first hour or more of the film in a catatonic state, with Shyamalan constantly shoving the camera right into his face so we can watch his eyes twitch while his head is cocked to one side. Once this entirely transparent ruse is abandoned, he’s reduced to something even worse – a blank slate used to deliver dialogue built to sound cool in the trailer. When the machinations of the plot begin to hit crisis point, it’s Jackson’s character who suffers the most – although McAvoy does look very silly as the roaring, rampaging Beast. The intriguing comic book analysis and commentary of Unbreakable is replaced by Mr Glass mugging at the camera and saying the name of a comic book thing (“the showdown”, “a collection of main characters”, etc) without making any further comment. There isn’t a single idea in Glass that Shyamalan didn’t express with more flair almost two decades ago. And that’s ultimately the problem. 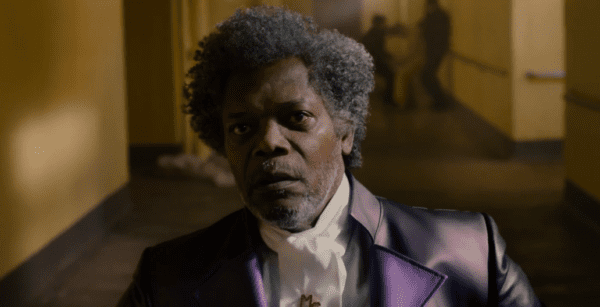 Glass was sold as the culmination of a masterplan, with Shyamalan as the puppet master pulling every string. The result is an awkward collage of half-ideas, delivered with no energy and enthusiasm. The movie isn’t in any hurry to get anywhere, telling its story without even a hint of the adrenaline that powered the second half of Split. This is most clearly encapsulated by Willis, who delivers one of his now trademark, yawning performances. Often, Willis wears the face of a prisoner being forced to dance the Macarena for a packet of cigarettes. Any notion that Shyamalan fans had of Glass serving as his own superhero team-up will have disappeared entirely by the movie’s conclusion. The final reel is essentially just a series of twist endings piled on top of one another with no sense of rhyme, reason or narrative coherence – like a Jenga game played by a squirrel. Jackson’s lines become a series of nonsense statements which are not only uninteresting, but actually don’t bear any relevance to what’s currently happening. If Willis just wants his pay cheque to arrive with minimum effort, Jackson is determined to earn it somehow. Ultimately, Glass is an absolute whimper of a movie. It lacks coherence, style or any raison d’etre and also commits the considerably graver sin of being boring. After the kinetic burst of its opening, the subsequent two hours are overlong, overly talky and build to a finale that is supposed to raise interesting questions, but falls totally flat in the wake of a film that has done its best to strip every flicker of intrigue from these characters. This is an effort from Shyamalan to establish himself as a world-builder that’s as transparent and fragile as, well, glass.